The 2019 Central Plateau SFOTY Tom Bridgens. A first-time entrant with a passion for dairy farming, the environment and animals, has won the 2019 Central Plateau Share Farmer of the Year. Tom Bridgens was announced as the region’s Share Farmer of the Year at the Central Plateau Dairy Industry Awards’ annual dinner at the Energy Events Centre, Rotorua, last month. Laurence Walden was named 2019 Central Plateau Dairy Manager of the Year, and Harry Phipps the 2019 Central Plateau Dairy Trainee of the Year. Tom, aged 22, is contract milking 300 cows on Rex and Loris Bates’ Tokoroa 80ha property and won $15,480 in prizes and four merit awards. He grew up in a dairy farming family, spending his spare time on the farm and began relief milking at age 13. Leaving school at 16, he worked as a farm assistant before going on his OE and returning to NZ in 2018 to contract milk. Tom entered the awards to streamline his business and work on his weaknesses. “As it’s my first year in a manager’s role, I wanted to run my business the right way from the start. Future farming goals include sharemilking by 2020 and farm ownership within 10 years. “I’ve had to overcome people telling me I am too young and inexperienced to take on a contract milking position,” says Tom. Runners-up in this competition are Anthony and Danelle Kiff, who won $6880 in prizes and two merit awards. They are contract milkers on the Tauhara North No2 Trust 230ha property at Tokoroa, milking 600 cows. Anthony has entered the awards five times and was 2017’s Central Plateau Dairy Manager of the Year. Future farming goals for Anthony, 34, and Danelle, 30, include beginning a dairy academy on their farm for the trust, training 18-25-year-olds. Third placegetters in this category are Bruce and Jo Husband, who are contract milkers on Bob and Bridget Hone’s 195ha, 600-cow Ngakuru property. They won $5130 in prizes and one merit award. He says benefits include becoming known within the industry as passionate about dairying farming, receiving feed-back on areas he could improve on and stepping outside his comfort zone. Kinleith farm manager Chance Church, aged 31, placed second and won $4120 in prizes. Chance works on Richard Maxwell’s 378ha farm, milking 1250 cows. Third place in this category is Bevan Samuel. The 50-year-old is farm manager on Pamu Landcorp Farming’s 334ha Reporoa property, milking 820 cows. 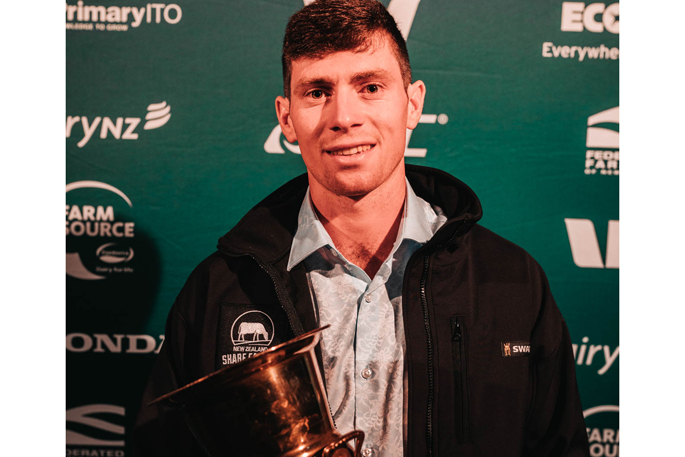 The 2019 Central Plateau Dairy Trainee of the Year, Harry Phipps hoped to better himself and continue to grow by entering. The 20-year-old is herd manager for Gary and Kathy O’Donnell milking 400 cows on the 140ha Rotorua farm. He won $5770 in prizes and two merit awards. Studying towards his Level 4 PrimaryITO Dairy Farming, he’s been offered a herd manager role. Runner-up is Claire Douglas, who is 2IC on the Theland Farm Group’s 320ha, 860-cow farm in Rotorua. She won $2220 in prizes. Third place went to assistant dairy production manager Bronte Marquet, aged 24, who won $1520 in prizes and one merit award. She works for Pamu Farms on the 340ha, 900-cow farm in Reporoa.